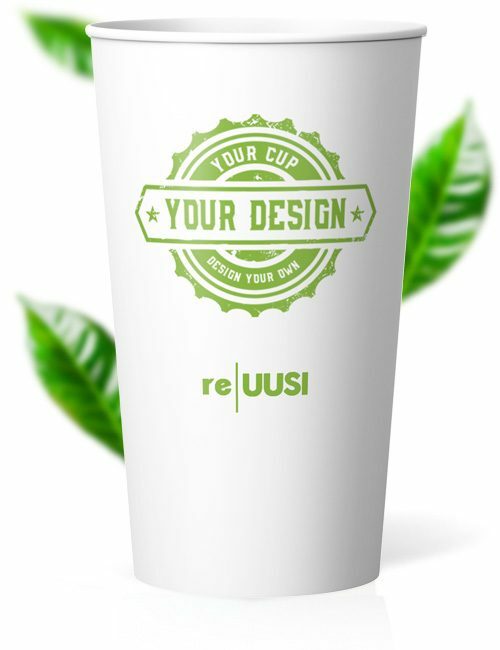 These re:Uusi printed recyclable coffee cups can be customised and printed with your own designs and processed by regular waste plants because of the exclusive EarthCoating® lining that has about 50% less plastic and easily separates from recyclable paper in the pulping process. Tea, coffee, juices, shave ice. You name it, these can serve it. With super quality 310 gm. board you’ll have happy customers that’ll be even happier they can toss their cups in the regular waste stream. Check out our galleries for examples of amazing spot colour finishes, cutouts, matt or gloss options and much, much more. We’re the printed cup company with all the branded paper cup options to suit your needs, with unrivalled print quality and service. Lets you order from just 1000 pcs. 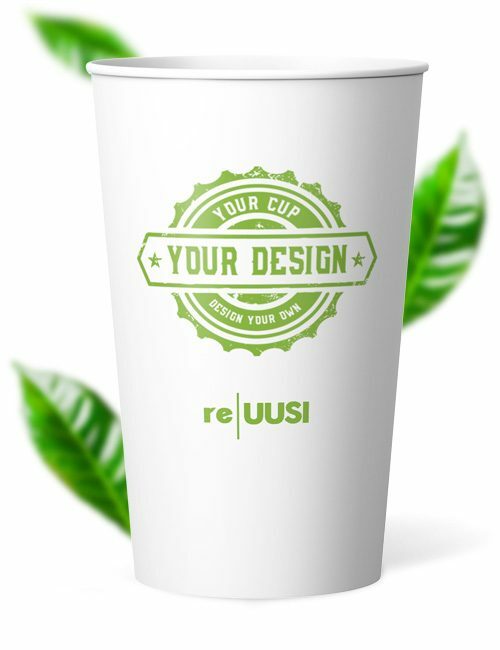 Be it 1,000 or 250,000 12oz Single Wall re|UUSI printed recyclable coffee cups, we deliver and design custom printed paper cups for your unique orders. 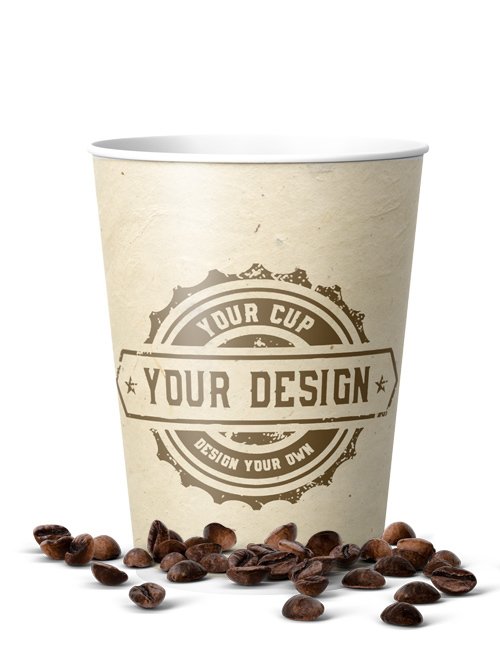 CupPrint delivers your custom cup to you within 14 working days! Start marketing smart with our custom printed paper cups. 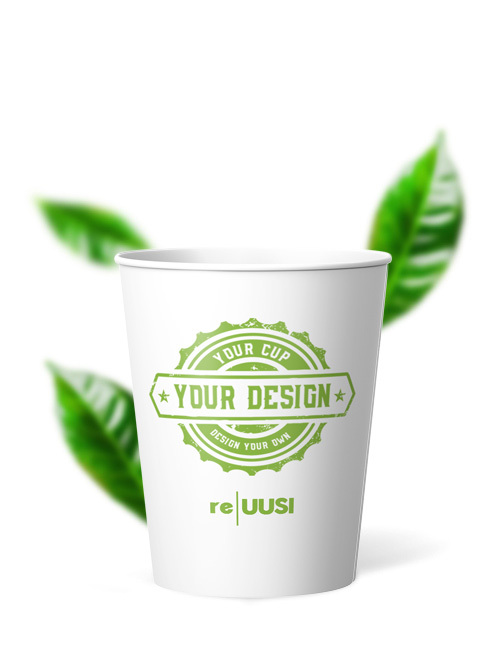 Short explainer video showing why traditional paper cups are NOT being recycled and why re|UUSI are the solution. Here are a list of the most common questions we receive about re|UUSI. For additional questions, please give us a call. 1. Does CupPrint suggest specific dimensions and colour specifications for designs? For colours, Pantone measurements are best. Providing Pantone specifications allows CupPrint to highlight colours on your custom printed cups most vibrantly. We also accept CMYK references if Pantone specifications are not available. For double wall cups, we can print in uncoated (matte) or coated (gloss) Pantones. As such, please make sure to specify if submitting a Pantone reference number (usually #U reference denotes uncoated and #C reference denotes coated). We’re happy to send samples. Our sample boxes are a random assortment. If you would like a pre-production sampling of your personal design please contact us. Learn more about our partnership with reUUSI, the first to-go cup engineered to be truly 100% recyclable, here. We’re proud to partner with reUUSI to redefine the standard for eco-friendly business practices within the printed paper cup industry. Call us at +49 800 28777468 or e-mail us at sales.europe@cupprint.com. EarthCoating® is a new paperboard barrier coating made of minerals and plastic (Calcium Carbonate and Polyethylene) By using EarthCoating® to create paper cups they become valuable to collect and easy to pulp into recycled paper using conventional recycling equipment. They also use 44-51% less plastic than traditional paper cups. Why can’t I recycle a traditional paper cup? It’s just paper right? Paper cups are not accepted as recyclable because of the difficulty paper recyclers have processing plastic-coated paper cup stock through their paper recycling equipment. The plastic is used to seal the cup during production and to keep the liquid from leaking through the paper. In order for paper cups to be labeled as “recyclable” in the U.S., over 60% of municipalities around the country need to accept them for recycling. In many EU countries this is changing and many more facilities are working to process plastic lined cups. Our recyclable range can be processed by any European pulping plant in stream 13. Are paper cups made with EarthCoating® compostable? 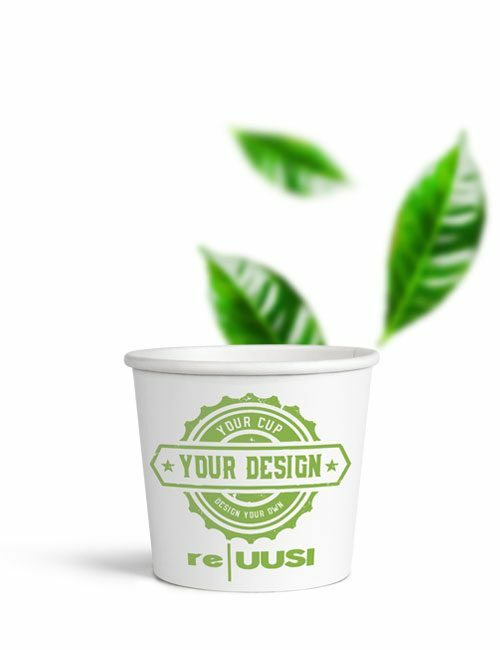 Sustainability claims for paper cups made with EarthCoating® vary based on what type of resin is being used. For example, paper cups made with EarthCoating® EC-51 (a blend of 51% minerals and 49% low density Polyethylene) are not compostable because of the petroleum-based plastic used in the coating. However, if we mineralize a bio-resin, we’re able to meet the necessary criteria to make compostability claims. What the difference between paper cups made with EarthCoating® and traditional paper cups? 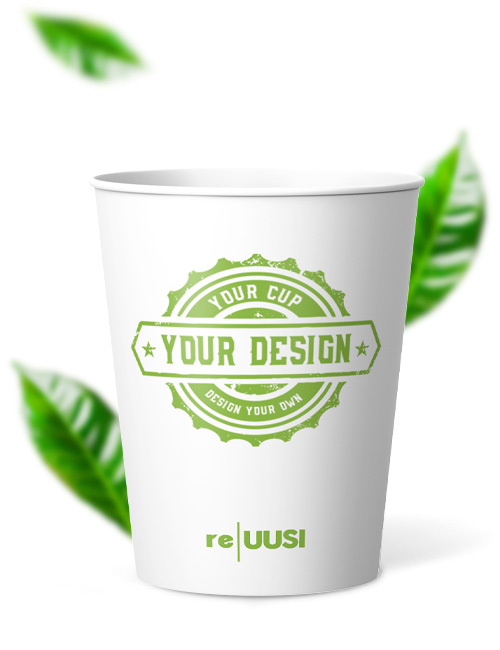 Paper cups made with EarthCoating® look, feel and perform the same as traditional paper cups. However, traditional poly-coated paper cups are too difficult for paper recyclers to process through their conventional recycling equipment because of the 100% plastic coating used to make them. Paper cups made with EarthCoating® may be easily pulped into recycled paper using conventional paper recycling equipment and they use 44-51% less plastic than traditional paper cups. Are paper cups made with EarthCoating® compliant for direct food contact? Yes, paper cups made with EarthCoating® are compliant for direct food contact in the US, EU and UK. To learn more or to view our certifications, contact CupPrint. Do paper cups made with EarthCoating® meet EU migration standards? Yes, paper cups made with EarthCoating® meet EU migration standards. To learn more or to view our certifications, contact Cup Print. Do paper cups made with EarthCoating® cost a lot more than traditional paper cups? No, unlike other “green” paper cup alternatives, paper cups made with EarthCoating® are within a 5% price range compared to traditional paper cups (a small price to pay for a paper cup that’s engineered to be recyclable and uses 44-51% less plastic than traditional paper cups). For your individual Single Wall re|UUSI 12 oz design we provide you here our rectangular template as PDF for download.